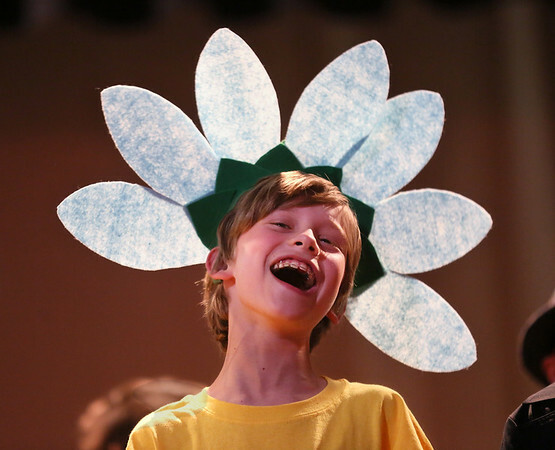 Jack Cummins sings a song during a rehearsal Tuesday for the fifth-grade play, "The Grunch," at Manchester Memorial Elementary School. Inspired by "The Grinch Who Stole Christmas," "The Grunch" is about a jealous boy who decides to steal the sets, costumes and lights the night before the school musical opens. All 72 Memorial school fifth graders have roles in the play, which will be performed Thursday at 4 p.m., and Friday and Saturday at 7 p.m. Admission is $10.